“As regards the Lomé negotiations, the process of unification – for such it was – added a new dimension to the Third World’s quest for economic justice through international action. Its significance, however, derives not merely from the terms of the negotiated relationship between the 46 ACP states and the EEC, but from the methodology of unified bargaining which the negotiations pioneered. “Never before had so large a segment of the developing world negotiated with so powerful a grouping of developed countries so comprehensive and so innovative a regime of economic relations. It was a new, and salutary, experience for Europe; it was a new, and reassuring, experience for the ACP States. With a conscious appreciation of that founding unity of purpose and action, the ACP Group convened a high-level symposium at its headquarters in Brussels on Jun. 6. The event marked the milestone of four decades of trade and economic cooperation, vigorous and contentious political engagements and a range of development finance programmes – all aimed at the eradication of poverty from the lives of the millions of people in its 79 member states. In 1975, it was 46 developing countries that met in the capital city of Guyana, to sign the Georgetown Agreement and give birth to the ACP Group. They had recently embarked on their post-colonial path of independence following successful negotiations of non-reciprocal trade arrangements with the then nine-member European Economic Community (EEC) in February. Known as the Lomé Agreement, after the capital of Togo where it was signed, this legally-binding, international agreement had a life-span of 25 years to 2000. Essentially, it comprised three pillars of trade and economic cooperation, development assistance – mainly through grants from the European Development Fund (EDF) – and political dialogue on issues such as human rights and democratic governance. During that period, the preferential trade and aid pact undoubtedly gave an impetus to various aspects of economic and social development in the ACP Group. Substantial revenue was received from preferential access to the European market for exports of clothing, banana, sugar, cocoa, beef, fruit and vegetables, for example, and with the accompanying aid programmes. The benefits were seen in the economies of Mauritius, Kenya, Cote d’Ivoire, Namibia, Guyana and Fiji, to name a few. Member states of the ACP Group, less-developed countries (LDCs), landlocked states and small island developing states (SIDS), had access to returns from trade for improved social services and in this sense, the first decades of Lomé were certainly gains for development in sub-Saharan Africa, the Caribbean and Pacific. But these gains entrenched an aid-dependency of commodity export economies with minimal structural transformation through value-added manufacturing and related service sectors in ACP countries. The fierce trade-liberalising world of the late 1990s, rising indebtedness due to enormous increase in the cost of energy and pressure from the challenge of the World Trade Organisation (WTO) to the European Union’s discriminatory practice of preferential trade and aid to this exclusive set of developing countries meant that post-Lomé ACP-EU trade relations had to be WTO-compatible. Finding compatibility for “substantially all trade” between the economies of the ACP’s 79 members – grouped in six regions of Africa, the Caribbean and Pacific – and Europe, and ensuring that development criteria take precedence over tariff reductions and WTO rules have proven contentious in this long-standing partnership. With this overhang of tensions in its troubled access to its principal market, the ACP faces the conclusion of the 20-year Agreement signed in Cotonou, the Republic of Benin, in 2020. A soul-searching and vigorous process to be repositioned as a global player defending, protecting and promoting an inclusive struggle against poverty and for sustainable development in a world enmeshed in inequality is the singular task on which the ACP now concentrates. Such a task has entailed a series of actions that are informed by the report of the Ambassadorial Working Group on Future Perspectives for the ACP Group of States that was approved by the Council of Ministers in December 2014. The main thrust of the transformation and repositioning of the ACP is captured in the strategic policy domains identified in the report. In each of these, and in ways that are mutually reinforcing, very specific programmed activities of an annual action plan are being prepared and will be executed. For example, the annual plan will address the thematic area of “sustainable, resilient and creative economies” through the mechanism of an ACP Forum on SIDS with financial resources, mainly from the intra-ACP allocation of the EDF and the UN’s Food & Agriculture Organisation (FAO), one of the partner agencies of the UN system with which the ACP Group works very closely. 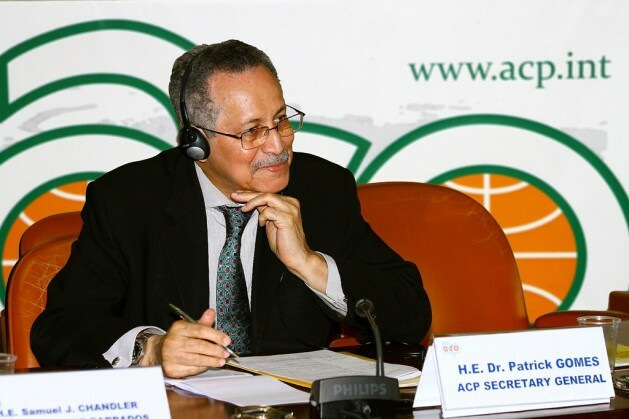 What Future for the ACP-EU Partnership Post-2015? Conceptualised so as to address systemic and structural factors affecting sustainable development, the ACP emphasises South-South and triangular cooperation as a major modality for implementation of its role as catalyst and advocate. The current stage of rethinking and refocusing provides an opportunity for 40 years of development through trade by which the ACP Group and the European Union could recast the world’s most unique and enduring North-South treaty of developed and developing countries to effectively participate in a global partnership where no one is left behind. The ACP has social and organisational capital accumulated from a rich experience on trade negotiations with the world’s largest bloc of Europe and its 500 million inhabitants. Undoubtedly marked by contentious issues on trade provisions to satisfy the WTO’s non-discriminatory behaviour among its member States, ACP-EU relations reveal the persistent battle of poor versus rich with a view to finding common ground on issues of mutual interest. The 40th anniversary celebration by the ACP Group at a High-Level Inter-regional Symposium on Jun. 4 and 5 witnessed reflections on achievements and failures, as well as limitations in the performance of the ACP Group, in itself as a group and among its member states, as well as in its partnership with the European Union and the wider global arena. The theme of the symposium covered the initial Georgetown Agreement and the ambitious objectives that were set in 1975. The high point was the keynote address by H.E. Sam Kutesa, President of the UN General Assembly. Interestingly, discussions revealed how relevant and timely they remain and of special note was the “promotion of a fairer and more equitable new world order”. This retrospective conversation has been recognised as fundamental for how, and in what direction, the ACP will craft its future path to continue the struggle against power, inequality and injustice, the core purpose for which it was established in 1975.